State University of New York Press, 9780791471883, 327pp. The revised edition of this beloved classic features a readers' and writers' guide to facilitate book group conversations and informal adult education, and also offers prompts for personal journaling exploration. Merle Feld's emotionally powerful prose and highly accessible poetry open the hearts of readers of all ages and religious persuasions who are traveling through the cycle of life and sharing in the search for meaning. Merle Feld is a writer, educator, and activist whose prose and poetry, including her signature poem about women and men at Sinai, "We All Stood Together," can be found in numerous anthologies and prayer books. Her memoir, A Spiritual Life, has been translated into Russian and enjoys a wide audience across the former Soviet Union; a Hebrew translation is forthcoming. Merle's theatre credits include the award-winning plays Across the Jordan, published by Syracuse University Press in the anthology Making a Scene, and The Gates Are Closing, performed by hundreds of congregations worldwide. A popular scholar in residence, Merle has taught frequently at synagogues, college campuses, and adult learning institutes. 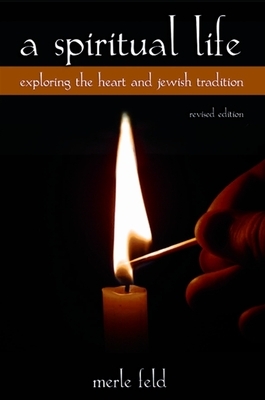 She has pioneered teaching writing as a spiritual practice, and since 2005 has served as Founding Director of the Rabbinic Writing Institute, guiding rabbis-in-training across the denominations to develop a personal writing practice through which to explore their own spiritual lives and to more effectively serve as spiritual leaders.